It all started in 1972 at Condobolin, N.S.W., when he saw kangaroos herded together, shot and clubbed to death. Until that moment, he had been 'normal.' He was a meatworker, working his way around Australia with his wife and three kids, but the sight of kangaroos being slaughtered, caused him to spend the rest of his life fighting for animals and the environment. Read more here. How well I remember reading headlines back in 2008 around the time of the infamous Belconnen massacre when Pat threatened that he and others would become a human shield for the kangaroos if necessary. In recent years that is exactly the strategy employed to try and stop these horrific blood baths of our national icon with a high level of success because when activists go into an area where shooting is occurring, police are notified and the shooters have to stop shooting or risk committing manslaughter. He was famous for saying that the reason why the kangaroo industry has never been able to meet their quota is because they can't find them and that the counting methods used to estimate populations was dodgy. In 2008 he challenged the Federal Minister's decision to approve the 2007-2012 Kangaroo Management Plan, having amassed a a formidable legal team including expert witnesses. However the Adminisrative Appeals Tribunal approved the Plan and he lost the case, in spite of all odds showing he should have won based on the precautionary approach. Read more here. Sheila Newman made a number of films interviewing this man (thank you Sheila!) which can be viewed below. It is self-evident what a truly humble spirited man Pat was, how passionate he was in his quest to protect kangaroos. Not only that but he was extremely knowledgeable about kangaroos, having broken the ground for Australia to wake up to the dire consequences of the kangaroo industry. Without Sheila's investigative journalism and video-making we would have little online record of this great man. Even google has no images of him. 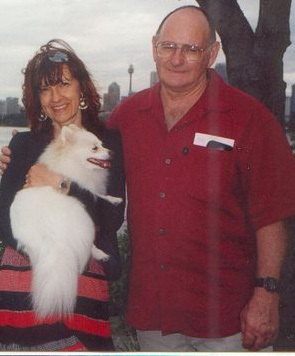 Left is Pat with Teresa Buss-Carden, Tadpolka her dog and Katherine. Below is a radio Interview on kangaroos of Pat O'Brien, Co-ordinator for the National Kangaroo Protection Coalition and President of the Wildlife Protection Association of Australia by Lea Budge, 101fm, dated 20th August, 2008. Click to listen to Part 1 and Part 2. "Losing Pat is a tragic loss for humans and animals alike. My acquaintance with Pat is purely professional, but I was touched by his determination to help kangaroos. As an aspiring wildlife biologist, specialising in wallabies and kangaroos, I was well entrenched in the existing academic dogma that the kangaroo industry was a good thing. Reading about Pat's work (and a few others) opened my eyes to the unspeakable suffering caused by this industry and the myths propagated to support it. Over the years Pat became a valuable source of information for my academic work. Moreover, his dogged determination to protect the animals he loved so dearly was an inspiration. 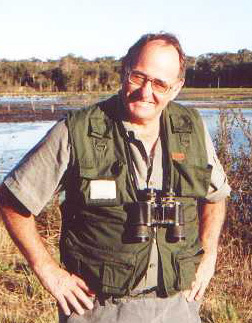 I know that even while suffering from the ills of cancer Pat still went out bush in the searing heat of summer to collect information for his beloved kangaroos. This lesson about love, doing what's right, and persisting will remain with me." Investment Associate: Sherman Group Ltd, 2 Paddington St, Paddington NSW 2021. 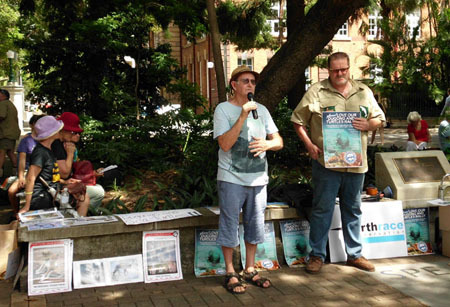 "I met Pat at the Earthrace Rally in Brisbane in Feb 2012, where we were all demonstrating for our endangered wild life. I was particularly thrilled to meet him as I had admired his work for along time. "My impression was of a gentleman who had a steely passion for his kangaroos. It was a real pleasure to have the chance to catch up with him in person - and I would add a truly decent person. "He was always very supportive not only for his kangaroos but for the dingoes I am fighting for. I have sent out and used over and over again his well written "History of Fraser Island" as it is concisely written giving probably the best concise back ground of the Fraser Island story. Read here. "Left is a picture of him at the Rally with the speaker Colin Riddell, the rally was organised by Alan Winstanley of Earthrace." My experience is that I met him very briefly 2 years ago at an Animal Liberation conference on the Gold Coast as he was rushing to catch a plane. It was a very warm and big-hearted man that shook my hand and his sincere caring radiated through his hands and eyes. Subsequently he wrote an endorsement for my children's book ‘Arktel, the Planet Only Children Could Save’ which can be read here (scroll down 3/4rds of the page). "Thats a very good speech Menkit, Im sorry you were not allowed to present it. The attitude that exists in many conservation groups is that we have to go softly, softly, or we upset people. So what? Let's upset them! "We dont have time to pussyfoot around, we are on a very limited time span, to being able to continue to exist on this Planet. Forget the so-called conservation groups, I urge you to put your considerable talents elsewhere where they will do more good. 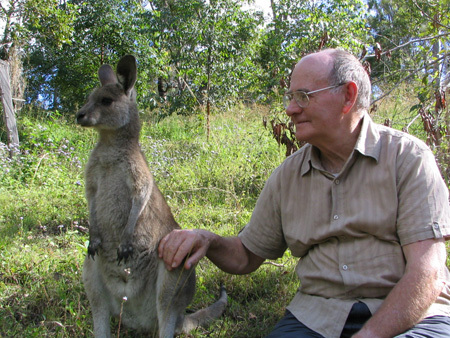 Cheers, Pat"
Below is a photo of him with a kangaroo rehabilitated by Anne-Marie Dineen. I invite you all to send me your stories to upload on this blog or simply type in your comment below. How ironic that he died on the eve of a Canberra Tribunal giving the green light to yet another kangaroo massacre of 1244 kangaroos in 7 Nature Reserves, rubber stamped by Greens Minister Shane Rattenbury - read here. He died at age 71 of cancer. Kangaroo activists around the world are devastated by the passing of this great man who made a qualitative difference for our maligned and vilified kangaroos. The battle goes on - it must go on. Perhaps he can help us even more on the other side? I feel his spirit shining down on us and within us, the ones who have vowed to protect kangaroos to the end, as he has done. Bless you Pat and thank you for all you have done! Thank you for including the interviews I did with dear Pat O'Brien. He had finished up being thanked and rewarded and recognised by Steve Irwin for his brave and innovative work, which ran against and still bawks Queensland and Australian mainstream environmental lockstep. Steve Irwin was a great man who could find other great people. I remember the simple pleasant house that Steve Irwin had provided for Pat for life. There were trees all around and it wasn't far from the Australia Zoo, where Pat still went to work. Pat also wrote adventure books, mostly I think about environmentalists. They were e-books ahead of time. I bought one, but cannot now remember what name he wrote under. I checked under amazon.com and google, but cannot track them down. If anyone has links to them, let's add these. In the mean time I will try to track down my copy.